Deus Ex: Mankind Divided is the new game in the Deus Ex series and you reprise the role of Adam Jensen, an ex-security officer who has delved deep into cyberpunk conspiracies. You can choose to play Mankind Divided however you want, with a variety of action and stealth options to choose from. Will you strap a huge gatling gun onto your arm, or put yourself in a huge augmentation shield? All the options are there, and how you approach it is part of the beauty that only Deus Ex can provide. Combined with multiple dialogue choices in a grey, multifaceted world. you can immerse yourself in the world of Deus Ex and become part of a living, breathing world. Deus Ex: Mankind Divided © 2015 Square Enix Ltd. All rights reserved. Developed by Eidos-Montréal. 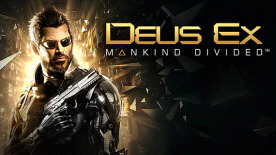 Deus Ex: Mankind Divided, Eidos-Montréal, and the Eidos logo are trademarks or registered trademarks of Square Enix Ltd. SQUARE ENIX and the SQUARE ENIX logo are registered trademarks of Square Enix Holdings Co. Ltd. All other trademarks are property of their respective owners.